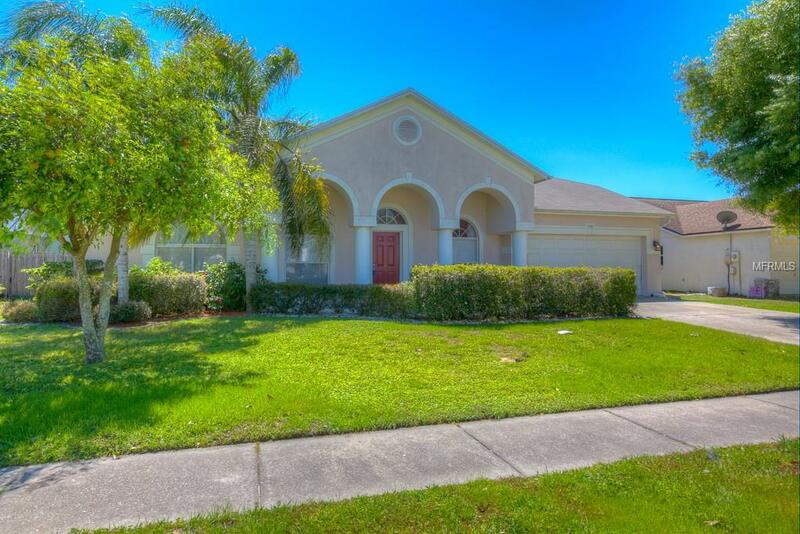 LOOKING FOR A POOL HOME IN THE RIVERVIEW AREA FOR UNDER $280,000 WITH NO CDD FEES AND LOW HOA? THIS MAY BE THE HOME FOR YOU. THE SUAREZ CELEBRATION FLOOR PLAN FEATURES 4 BEDROOMS AND 3 BATHROOMS. WALKING DISTANCE TO THE COMMUNITY PARK AND ELEMENTARY SCHOOL. THE FLOOR PLAN IS VERY OPEN STARTING WITH THE FORMAL LIVING AND DINING ROOMS ACROSS FROM EACH OTHER. THE 4 BEDROOMS HAS ITS OWN BATHROOM. REMODELED VANITY IN 2015. FRESHLY PAINTED INTERIOR. A VERY OPEN CONCEPT OF FAMILY, KITCHEN AND DINETTE AREAS LOOKING OUT TO THE SCREENED SWIMMING POOL AND FENCED BACK YARD. ROOF WAS REPLACED IN 2015. ENTIRE AC SYSTEM IN LAST 3 YEARS. MASTER BEDROOM AND BATHROOM ARE LOCATED IN THE BACK LEFT CORNER OF THE HOME. THE MASTER BATHROOM HAS A WALK IN SHOWER WITH SEPARATE GARDEN TUB AND WATER CLOSET AND DUAL VANITY SINKS AND LARGE WALK IN CLOSET. CEILING FANS THROUGHOUT. STAINLESS STEEL KITCHEN APPLIANCES. WASHER AND DRYER CONVEY. LOOKS OF NATURAL LIGHT ENTERING THE HOME FROM ALL THE WINDOWS. THREE WAY SPLIT FLOOR PLAN. SECOND AND THIRD BEDROOMS SHARE THE POOL BATHROOM WITH REMODELED VANITY. HOA FOR THE COMMUNITY IS $30 A YEAR. CHARTER ELEMENTARY SCHOOLS UP THE ROAD. MACDILL AFB BUS RUNS UP AND DOWN BOYETTE ROAD FOR PICKUP MONDAY-FRIDAY. COMMUNITY IS VERY CONVENIENT TO SHOPPING, DOCTORS OFFICES, GOLFING, RESTAURANTS. CLOSE ON THIS HOME BEFORE SCHOOL ENDS FOR THE YEAR AND START ENJOYING THE SWIMMING POOL AND SUMMERTIME PARTIES AND BAR-B-QUES. Listing provided courtesy of Belle Maison Property Management, Llc.